This rarely worked well in practice, unfortunately. Most SOA projects in the last two decades failed. Instead of using an ETL tool or ESB for this, enterprises are now moving on to a streaming platform to solve this issue. Is this the next bubble on the market? Just a new term? Or, did something really change to allow successful integration across an enterprise—whether you integrate legacy mainframes, standard applications like CRM and ERPs, modern microservices built with any programming platform, or public cloud services? 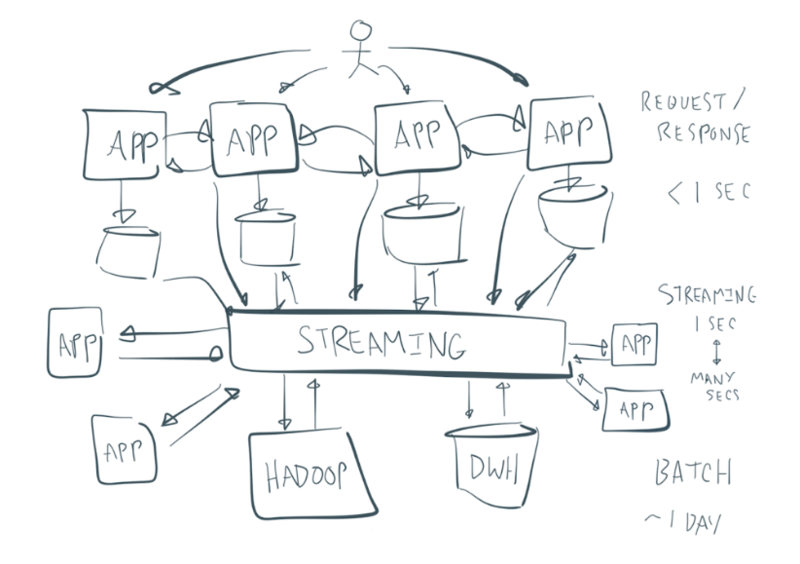 Why are companies now migrating to Apache Kafka to build this streaming platform? Why is everybody happy and talking about this at conferences, tech talks, and blog posts? How does it compare to an ESB or ETL tool? The next sections will answer all these questions, and explain the reason and differences between the open source ecosystem of Apache Kafka and other existing integration solutions. A streaming platform (you can also enter another buzzword here) leverages events as a core principle. You think in data flows of events and process the data while it is in motion. Scalable central nervous system for events between any number of sources and sinks. Central does not mean one or two big boxes in the middle but a scalable, distributed infrastructure, built by design for zero downtime, handling the failure of nodes and networks, and rolling upgrades. Different versions of infrastructure (like Kafka) and applications (business services) can be deployed and managed in an agile, dynamic way. Integrability of any kind of applications and systems. Technology does not matter. Connect anything: programming language, APIs like REST, open standards, proprietary tools, and legacy applications. Speed does not matter. Read once. Read several times. Read again from the beginning (e.g., add new application, train different machine learning models with the same data). Distributed storage for decoupling applications. Don’t try to build your own streaming platform using your favorite traditional messaging system and in-memory cache/data grid. There is a lot of complexity behind this and a streaming platform simply has it built-in. This allows you to store the state of a microservice instead of requiring a separate database, for example. Openness without commitment to a unique technology or data format. The next new standard, protocol, programming language, or framework is coming for sure. The central streaming platform is open even if some sources or sinks use a proprietary data format or technology. Independent and decoupled business services, managed as products, with their own lifecycle regarding development, testing, deployment, and monitoring. Loose coupling allows for independent speed of processing between different producers and consumers, on/offline modes, and handling backpressure. 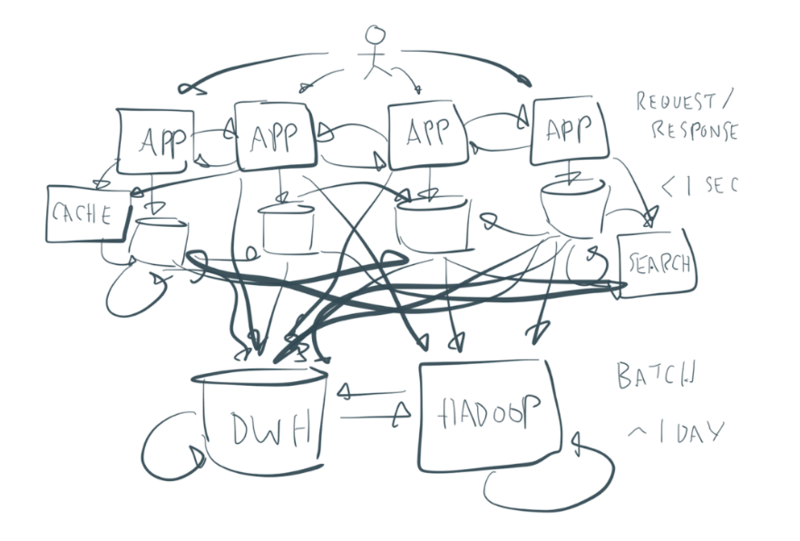 Multi-tenancy to ensure that only the right user can create, write to, and read from different data streams in a single cluster. These characteristics build the foundation of a streaming platform, the beginning of your successful digital transformation. With services implementing a limited set of functions, and services being developed, deployed, and scaled independently, you get shorter time to results and increased flexibility. This is only possible with a streaming platform having the above characteristics. Producer and consumers of different applications are really decoupled. They scale independently at their speed and requirements. You can add new applications over time, both on the producer and consumer side. Often, one event is required to be consumed by many independent applications to complete the business process. 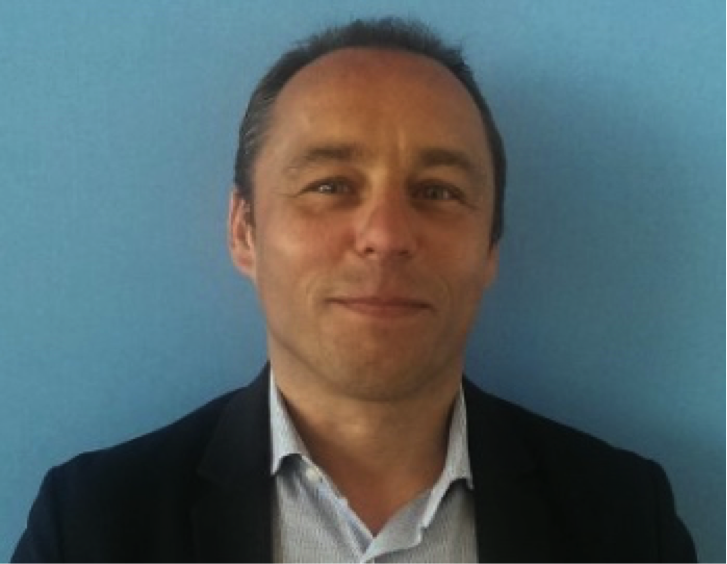 For example, a hotel room reservation needs immediate payment fraud detection in real time, the ability to process the booking through all backend systems in near real time, and overnight batch analytics to improve customer 360, aftersales, hotel logistics, and other business processes. Now, you understand the added value of a real decoupled, scalable streaming platform. So, do I have to introduce this as a central data platform for all of our applications? Caution! No mature enterprise can do a big bang successfully. Legacy applications exist everywhere. Go step by step from pre-streaming to streaming platform. If you come from the mainframe ages, then you might even have batch and non-streaming applications forever (or realistically at least for the next 20-30 years). That’s fine. You just need to bring the events from these systems into the event-driven central nervous system. 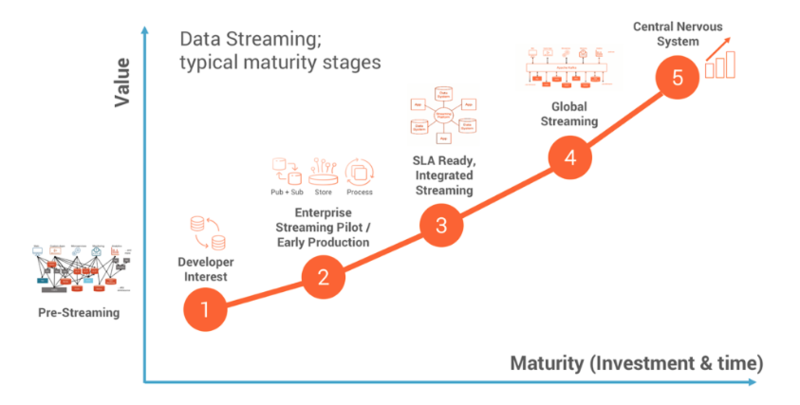 Most traditional enterprises start their journey in the pre-streaming phase. That’s totally fine. The next section explains why almost any successful transformation into a streaming platform leverages the Apache Kafka ecosystem as a key architectural component. Often people are familiar with Apache Kafka, as it has been a hugely successful open source project, created at LinkedIn for big data log analytics. That was the beginning of Kafka, and just one of many use cases today. Kafka evolved from a data ingestion layer to a real-time streaming platform for all the use cases previously discussed. Many projects focus on building mission-critical applications around Kafka. It has to be up and performant 24/7. If Kafka is down, their business processes stop working. The uniqueness of having messaging, storage, and processing in one distributed, scalable, fault-tolerant, high-volume, technology-independent streaming platform is the reason for the global success of Apache Kafka in almost every bigger company on this planet. Additional clients for non-Java programming languages, including C, C++, Python, .NET, Go, and several others. All these open source components are based on top of the core messaging and storage layer of Apache Kafka, and all leverage its features of high scalability, high volume/throughput, and failover. Younger companies like Netflix, LinkedIn, and Zalando built their whole infrastructure on Kafka. Older companies are not that fortunate because they have plenty of mainframes, monoliths, and legacy technology. However, as discussed, a big bang replacement is not the right way to be successful. It’s a lot like transforming your home. Although it might make sense in theory to rebuild it from the ground up, oftentimes it is more practical to extend the house, change certain rooms, or redecorate. Innovate by integrating your old systems via a streaming platform—i.e., the Apache Kafka ecosystem. Use concepts like change data capture (CDC) and integration tools, such as an ESB or ETL, with great graphical tooling and connectors for legacy applications. With this foundation, you can build new applications with modern technologies, big data systems, machine learning, etc., natively around Apache Kafka, and at the same time keep access to your legacy events, which you still need for added value in new projects. Real decoupling and technology independence also means that you have dumb pipes and smart endpoints. If you build all the integration logic (or, even worse, some business logic) into the central integration layer, then all your scalability, agility, and independence of the different systems are gone. This is a key difference to traditional integration solutions in which you put all the logic in the middle layer ESB. It creates dependency on this (proprietary) technology/API, as well as inflexibility. Smart endpoints can be anything. You can leverage the Kafka ecosystem to build applications around Kafka with Kafka Streams, KSQL, or any Kafka client like Java, .Net, Python, or Go. You can also use any other application to integrate other applications with Kafka. The secret to long-term success is that the infrastructure is open to any technology and architectural pattern. Kafka’s official low-level client APIs like Java, .NET, Go, and Python implement a direct integration if no other more feasible integration option is available. Apache Kafka and its ecosystem is designed as a distributed architecture with many smart features built-in to allow high throughput, high scalability, fault tolerance and failover! Let the product or service teams build their applications with Kafka Streams, KSQL, and any other Kafka client API. Integrate Kafka with ESB and ETL tools if you need their features for specific legacy integration. An ESB or ETL process can be a source or sink to Apache Kafka like any other Kafka producer or consumer API. Oftentimes, the integration with legacy systems using such a tool is built and running already anyway. Currently all these tools also have a Kafka connector because the market drives them this way. So, you just need to combine the existing integration with the Kafka connector, and there you have it: flexible, scalable and highly available integration between legacy and future ecosystems through Kafka. Apache Kafka is an open source streaming platform that allows you to build a scalable, distributed infrastructure that integrates legacy and modern applications in a flexible, decoupled way. It is already battle-tested for processing trillions of messages and petabytes of data per day. Simply leverage the Apache Kafka ecosystem in your enterprise architecture to make integration of your various systems successful and dynamic. But whatever you do, do not try to build an ESB around Kafka—it is an anti-pattern that will create inflexibility and unwanted dependencies. Instead, leverage the distributed architecture of the Apache Kafka ecosystem to build a flexible, event-driven streaming infrastructure with high throughput, high scalability, fault tolerance, and failover.